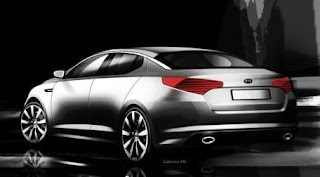 Korean manufacturer Kia will show off its new Magentis for the first time at the New York International Auto Show in April. The choice of venue for the launch probably reflects the fact that company's medium-large saloon is more popular in North America than here in Europe. First indications (see picture) are that the next Magentis will have a more striking design than the present bland, if competent, version, which has tended to be over-shadowed in the UK market by the success of Kia's smaller models such as the Picanto and the cee'd. The new car will be larger in every dimension than the old one; in particular, a longer wheelbase means that there will be more space for passengers. While it's holding over the Magentis for New York, Kia's stand at next month's Geneva Motor Show will hardly be bereft of new models; besides a new version of the Tucson small SUV, there will also be the still-fresh Venga and second-generation Sorento.